Hope's Cafe: Genesis Today Review!! Genesis Today is a company I have worked with before, and I loved their products! So, I was thrilled when they offered to send me a sample of their new Veggie Blast Juice, and some Vitamin Chews. For those who aren't familiar with Genesis Today, this company offers great juices, vitamins and supplements that are loaded with nutrients, minerals and antioxidants! Very healthy, and very tasty! 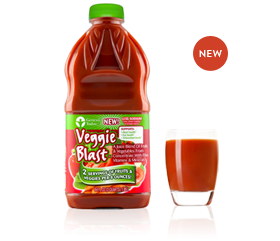 First, the Veggie Blast Juice-this is not just your average tomato juice. It's not as thick (something that sort of turned me off of drinking tomato/vegetable juice previously), yet it is very richly flavored! It's not salty, either, which I liked. The best part, though, is that in one 8 oz. glass, there are 2 full servings of fruits and vegetables! There are over 12 fruits/veggies packed into this drink, including carrots, kale, red bell pepper, spinach, and, of course, goji berries-one of the healthiest fruits! 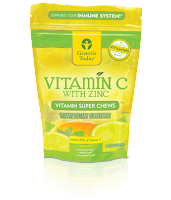 I also got to sample the new Vitamin C with Zinc Chews. 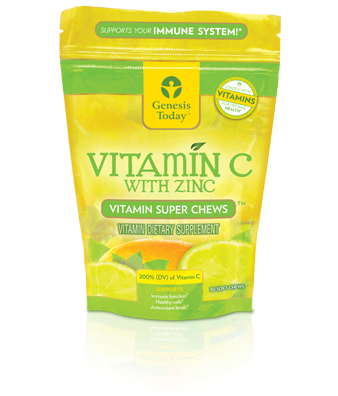 I like to have one or two Vitamin C every day, and this was a great-tasting way to get a Vitamin C boost! Even the kids enjoyed these! With how fresh they taste, you almost forget that it's good for you too! I really liked these, and will be purchasing them in the future! They're very easy to find, too- you can get them in the checkout aisle of your local Wal-Mart! Genesis Today also kindly included some coupons for some of their other juices. So, I got another chance to taste some of their wonderful beverages! My personal favorite is the Reservatrol juice. This one has a fresh taste with a strong grape flavor. The reservatrol juice helps support cardiovascular health, and also helps with healthy inflammatory processes. The Goji berry is known as the "happy fruit", and is naturally full of nutrients that support positive moods I told my brother to make sure he drank a lot of this one! Just kidding :) He really liked the flavor, and knowing that he was getting a full dose of vitamins and minerals made it even better! My Dad got to sample the Acai Berry juice this time, which is packed with antioxidants to help support healthy skin, hair, and even weight. He said he liked it...even asked if we had any more! I guess we'll be picking up some Genesis Today juices next time we go to Wal-Mart! Disclaimer:I was not monetarily compensated in any way for this post. I did receive product for the purpose of review. All thoughts and opinions are mine. All quotes taken from the Genesis Today website.